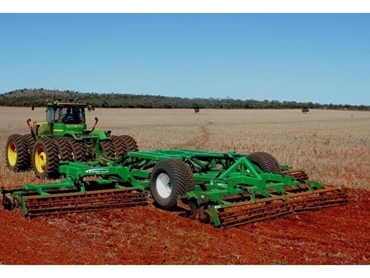 Speedtillers from K-Line Industries have been a huge success since release in 2010. The efficient disc-tilling machines can both cut and evenly distribute trash producing a protective barrier which prevents moisture loss and improves trash flow in tine seeders. The discs are independently mounted on rubber suspensions with robust bearing assemblies that enable maximum working depths and effective soil conditioning. Provided at the rear is a depth gauging roller that produces a crumbling effect on the soils profile. The Speedtillers operate effectively at high speeds allowing a fuel efficient operation and permitting stubble residues to pass easily through tined seeders. Not only is the K-Line's Speedtiller highly fuel efficiency with reduced wear-and-tear, it is ideal for soil conditioning in the presence of high levels of crop residues. Available in both vineyard and orchard models with full hydraulic lift and fold, the Speedtillers also range from 1.75metres to 9metres.